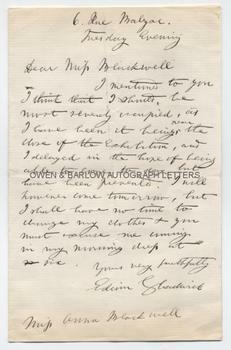 SIR EDWIN CHADWICK Autograph Letter Signed. Public health reformer, whose reports led to the passing of the Public Health Act 1848 and the establishment of the local Boards of Health, the precursors to Local Government. ALS. 1p plus integral blank leaf. 6 rue Malzac. Tuesday evening, no date or year. 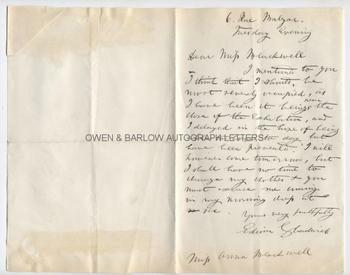 To Miss Anna Blackwell (the sister of Dr. Elizabeth Blackwell). 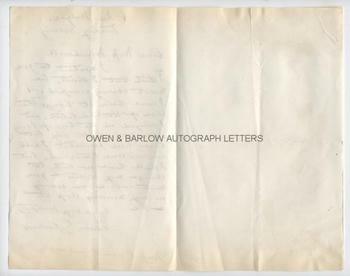 "I mentioned to you I think that I should be most severely occupied, as I have been, it being near the close of the Exhibition, and I delayed in the hope of being able to come today but have been prevented. I will however come tomorrow, but I shall have no time to change my clothes and you must excuse me coming in my morning dress at six." 8vo. Approx 5.25 x 8 inches. Mounting traces and small piece of old album leaf attached to top corner of verso of blank last leaf. All else very good. Sir Edwin Chadwick can lay claim to being the world's first active campaigner for environmental health and he was certainly amongst the most influential of figures in laying the foundations for a proper system of public sanitation. At the invitation of Napoleon III, Sir Edwin Chadwick had visited Paris in 1864 to assist with preparations for the Paris International Exposition of 1867. The letter presumably dates from that year. Anna Blackwell (1816-1900) was the elder sister of Elizabeth Blackwell, the first woman to gain a medical degree in America and the first to be registered on the British roll of medical practitioners. Anna Blackwell had founded a school in America with her sisters but later gave this up to pursue a career as a poet, translator and journalist. She settled in France where she translated the French socialist Fourier and the novels of George Sand. Whilst in France she wrote weekly columns for several newspapers in America, India, South Africa, Australia and Canada, often under the pseudonym 'Felicitas'. Provenance: From a 19th century album compiled by the Blyth family. Edward Blyth, a London solicitor, was a friend and legal advisor to Elizabeth Blackwell.